The following is a list of ways to go from Krakow, Poland to Lviv Ukraine. I live in Krakow and go to Lviv a lot for various reasons. Many people touring Eastern Europe are fine with going to Poland and EU country but are afraid to cross out of the Schengen zone. If you are in Poland for more than a couple of days you might want to consider a trip to Lviv. The Polish city of Lvov was once the cultural capital of Poland. Krakow was considered a smaller town in comparison. 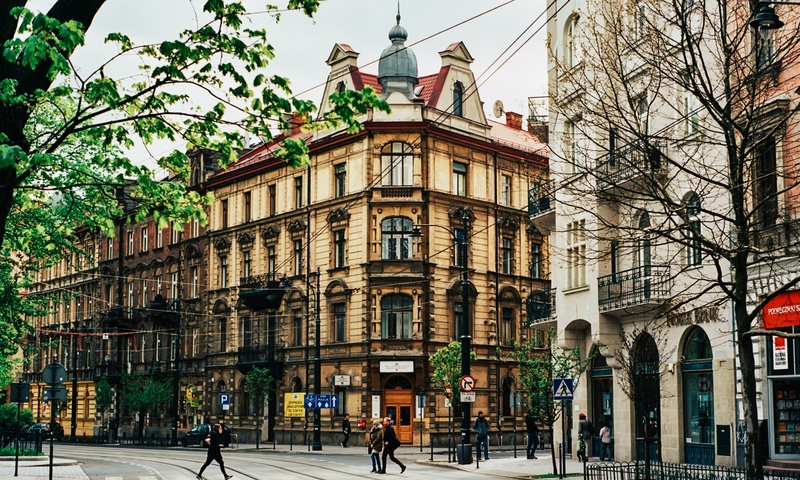 Many people speak Polish in Lviv and the city is multi national and tourist friendly. The return trip is easy as once you get there you can just do the reverse. You can get a bus from Krakow to Lviv for 70 pln or about 22 dollars. This is the simple way, it leaves every night from the main bus station in Krakow at 8 pm. The bus often does not have a bathroom so do not drink water or ask the driver to stop the bus. I have in emergencies. When nature call you can not hang up the phone. I drank 1.5 liters of water and boarder the bus. I did this as I thought the bus came in 1 1/2 hours, but just as I finished the bus pulled up for its 12 hour trip. Another more complicated way which I do personally as I like day travel and trains over buses. I go from Krakow to Przemyśl, a Polish town on the Polish-Ukrainian border. You can get there in 3 1/2 hours. It costs about 15 dollars or 40 Polish złoty. At Przemysl take a Marshrootka or van to the for 2 PLN there are white vans or small buses that are everywhere, just ask someone in English. Do the same to get to Lviv once you cross the Polish boarder, they come ever 20 minutes. I have been stuck there in the middle of the night because I think they stop at about midnight and had to wait until 5 am. I slept on the grass. Any travel in Ukraine is much cheaper than travel in Poland, about 1/3 or less the price. For example I went 26 hours on a Ukrainian sleeper train to Crimea for about 20 dollars once. This same Polish train would cost about 200 dollars. You can buy a ticket to Lviv for about 50 dollars in a sleeper car. This is the most comfortable way to get to Ukraine from Poland. But it is also the most expensive (I am not talking about flying or with a private car). If you have tons of cash many Jewish Rabbis have a private car to Lviv and this can be arranged also at the Edan hotel in Krakow. I have flown once but for a strange reason, no worth it generally. My friend who is a girl hitchhikes, I have tried begging a ride also. My recommendation is if you do this hold up a sign that says your destination like “I am going to Lviv”. Best in the Polish language of course. Ukrainian currency – I change currency in Poland. I look for the best rate. The worst place to change money is in the Lviv train station. Just be aware. In Lviv itself there are many places, just check the rates. Visa requirements for Ukraine – there are none if you are European or American. Ukrainian boarder crossing – The guards are looking for illegal trade, this does not affect you, tell them you are a tourist and you can cross the boarder in 20 minutes instead of 3 hours. Really, I flash my American or Polish passport and speak English and I am hustled to the front of the line. The line is really only for people making money going from Poland to Ukraine for economic reasons. Where to eat in Lviv – Any student cafeteria like Rodzinka or Puzata hut (hata). Three dollars a meal. Kosmonaut Hostel (10 dollars), very cheap but nice. If you have any questions on how to get from Krakow to Lviv let me know. Also let me know about your experiences if you have ever been to Krakow or Lviv. I am a student and i want to celebrate new years eve in lviv. I land in Krakow on the 30th of december at around 2pm and i would like to get to lviv as fast as possible. What are my options? I heard pedestrian border crossing in Przemyśl is the fastest option? I am EU-citizen: is this an advantage for passing the border? I am an Italian citizen but currently live and work in Krakow. As I have 4 days off in a row next week I am thinking to go for a short trip to L’viv. My Ukrainian coworker recommend me a couple of websites where I can buy the bus tickets (I didn’t find any ride available on blabla car yet, unfortunately! ), but to be honest I don’t really feel very safe to do transactions and shopping online, and still prefer to buy things in proper shops or kiosks. Do you know if it is possible to purchase bus tickets from Krakow’s main station (near Galeria Krakowska, if I don’t mistake)? Could you tell me the name of the bus company, please? Do you have any updated information? I’m a young woman traveling on my own. I would be very grateful if you could give me some advices. I always bought tickets from the main train or bus station near Galeria Krakowska. I always felt safe. In Eastern Poland and Western Ukraine people are not attacking people, it is safe on the trains and buses. It is safe like Krakow is safe. I have personally never heard of anything happening to people going to and from Lviv from Krakow, there are many students and travelers like yourself. Is it really safe traveling by car, cross board and continue through UA ? I read that there is dangerous also with police control and etc. What is your opinion? It is safe, just do not bring a rental car. We are planning to go from Krakow to Lviv on July 30, stay there some days and on August 3 we intend to go to Warsaw, In Lviv we would like to go also to Bukaczowce, my father’s birth city (I think that it is not far from Lviv). What do you suggest? By train or bus? Is there a non stop flight? Rent a car? Hire a travel company? And how to go from Lviv to Warsaw? I would take a train or a plane. I personally like the train as you see the countryside but if you are not into that type of travel and have money take a plane. I have also done a car but that is expensive. If you want to be cheap take a train to Lviv and switch in Lviv and get a Ukrainian train, it will cost you 50 dollars. Great blog. I’ve not read everything, but quite a lot. My family and I recently returned from European travel. We visited my wife’s relatives in Denmark and then flew from Sweden to Cluj, Romania. We crossed into Ukraine staying in the Carpathian area and then to Lviv by train. We really liked Lviv and are glad we went there as we didn’t have much of a set itinerary after the first 2 weeks of our trip. We thought we would be returning to Romania from Carpathians but once we decided to go to lviv we went on to Krakow and didn’t go back to Romania. I found it very easy to book tickets online using the Ukrainian train website and changed trains at Premesyl making an easy connection on to Krakow. The Polish train website was also easy to use for booking tickets. In Krakow we rented a car to travel around the area. I felt that Poland was like going into the future as everything was so nice. We were very impressed with how much has changed in the last 30 years. We drove on to Dresden and then to Berlin again marveling at changes in old East German area. I too, lived in Palatka but only for a summer working as a surveyor on a large construction job at the paper mill that might still be there. This was between my 3rd and 4th year of university and was very good experience for a civil engineer. I am originally from West Virginia and didn’t like Florida very much, especially in summer. I have lived in Minnesota now for 34 years but still prefer WV to here, but my wife is from here so here I am. I came to your blog by looking for info about relocating to Poland, that’s how much we liked it there. There’s much to like about a place that is very safe, very modern but still has good traditions, and isn’t plagued by drug use and so many of the other social ills we have in U.S. Yes Palatka is nice, I live in Saint Augustine which is about 30 miles east of course, if you are in town and would like to talk about questions let me know. WV is a beautiful place if you have money as the economy is not great. Florida as the advantage that it does not have Lyme disease or at least in great numbers. I found travel easy in Poland and Ukraine as the system of trains, buses etc are extensive. Very simple. From Krakow to Przemysl by train, after to Lwow (important, not Lviv) by car (order on BlaBlaCar) crossing across border checkpoint Medyka – Szeginie.